We’d love your help. 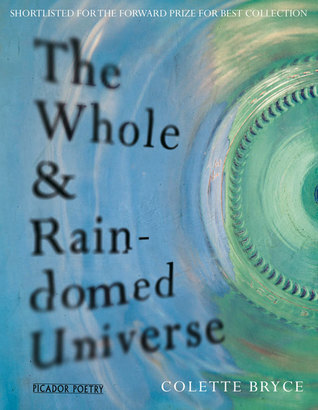 Let us know what’s wrong with this preview of The Whole & Rain-domed Universe by Colette Bryce. 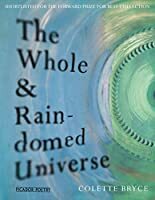 The Whole & Rain-domed Universe is Colette Bryce's much-anticiapted follow-up to Self-Portrait in the Dark. The book presents the reader with an extraordinarily clear-eyed, vivid and sometimes disturbing account of growing up in Derry during the Troubles, with many ghosts both raised and laid to rest. To ask other readers questions about The Whole & Rain-domed Universe, please sign up. My morning awakening. Honest review from a poet's perspective. of the ridiculous. High ceilings. by the river Foyle with its suicides and rip tides. What an awesome collection of poems! Intelligent and playful constructions, some in free verse and some with a rhyme scheme. I only wish the collection was bigger. I had the great pleasure of taking a course in college titled "Contemporary Irish Women's Poetry", and we finished our course with the poetry of Colette Bryce. As an added bonus, Colette herself happened to be visiting the university as a poet-in-res, and she sat in on our last few classes. To say that she is insightful, warm, and a brilliant writer are all total understatements - every commentary she offered, both on her own poetry and on other poets we were reading, was a true and intuitive tr I had the great pleasure of taking a course in college titled "Contemporary Irish Women's Poetry", and we finished our course with the poetry of Colette Bryce. As an added bonus, Colette herself happened to be visiting the university as a poet-in-res, and she sat in on our last few classes. To say that she is insightful, warm, and a brilliant writer are all total understatements - every commentary she offered, both on her own poetry and on other poets we were reading, was a true and intuitive treasure. I enjoyed the class for all of the issues we explored that arise when women writers wish to subvert the canon they unfortunately albeit naturally inherit - one that both exiles and exploits the feminine. But, having the opportunity to listen to Colette's opinions and insights on the matter was a truly enlightening experience. Bryce presents a 'personal reckoning' of her life, family, environment and culture that is raw and cutting in places, putting Derry and the Troubles into a tangible poetic force for the reader. I'm particularly bowled over by her sense of place and space, highlighting the limitations and possibilities that are constantly at work between the writer and their origins. It's a tremendously good collection. Bryce summons up and conveys what it was like to grow up in Derry in the 1970s and 1980s, focussing on the family home but looking also at what was happening outside, exploring the contradictions between warmth and claustrophobia, her relations with her mother, violence both domestic and political, and finding new ways to be oneself in a stranded society. This didn't take me long to read at all, but I still felt like I got a lot from it. I'll probably go back and read the poems again; I'd like to get inside them a bit more.